The House Oversight and Government Reform Committee is seeking information on payments made to major global banks including Goldman Sachs, Morgan Stanley, Barclays, Bank of America, Deutsche Bank, and Societe Generale. 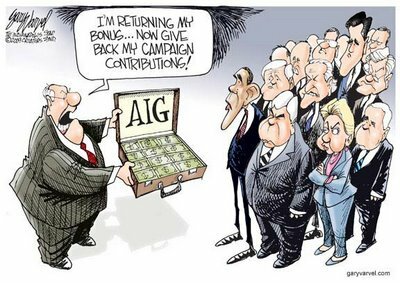 Mr Geithner was president of the New York Fed at the time that decisions involving the money from the bail-out of failed insurer American International Group (AIG) were taken. The panel is seeking emails, phone logs and meeting notes from the New York Federal Reserve and Mr Geithner, among others, on the discussions held ahead of the bail-out decision. “Questions remain surrounding AIG’s credit default swap counterparties and why these companies received full compensation, when the best they could have hoped for in a bankruptcy proceeding was perhaps 30 or 40 cents on the dollar,” the panel said in a statement. I hope everything comes back o.k Timmy, otherwise I smell a resignation in the air. How much did the Auto bail out make for the taxpayers??? Um, how about how much did it lose? The Obama administration will tell Congress Wednesday that it expects to lose about $30 billion of the $82 billion government bailout of the auto industry. Thats certainly some coins change. Gene Sperling, senior counsel to Treasury Secretary Timothy Geithner, confirmed in an interview late today that the administration’s forecast is that it will lose $30 billion on its auto investments — but that’s down from an earlier estimate of $44 billion. “The real news is the projected loss came down to $30 billion from $44 billion,” Sperling said, noting that auto sales have improved ahead of what many analysts had forecast. The administration still holds out hope that if things improve, the administration could still recover more. The estimate — the first public accounting of losses connected to the rescue of General Motors and Chrysler — is in line with what the Government Accountability Office, the Troubled Asset Relief Congressional Oversight Panel and former auto czar Steve Rattner have suggested. The Treasury Department has loaned $50 billion to General Motors, and swapped all but $6.7 billion of it for a 61 percent majority stake in the automaker. In order for taxpayers to be repaid fully, GM’s stock would have to be worth far more than current estimates when the company goes public as early as next year. The administration forgave much of Chrysler’s $12 billion in government loans….well thats nice, will someone forgive me for my mortgage? Well, thats good news, only $30 Billion instead of $44billion. Idiots! 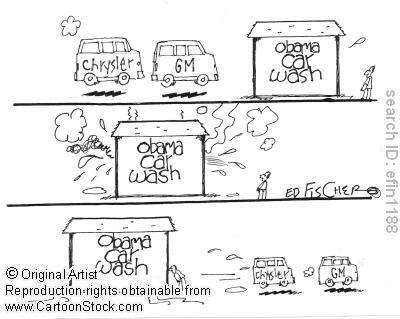 Saving General Motors and Chrysler saved hundreds of thousands of jobs, President Barack Obama said today. Not politicially poopular…yeah $30Billion is gonna do that, plus the private airplanes to get there are goign to hinder popular. CIT group filed for bankruptcy on Sunday afternoon – but under a so-called prepackaged bankruptcy plan that will enable it to emerge from court protection by the end of the year, under the control of its debtholders. CIT received $2.3 billion in government aid last year, a bailout that came in the form of preferred stock. That will almost certainly be wiped out in the bankruptcy process, the first realized loss in the government’s rescue of the financial system. CIT was the nation’s largest provider of what is known as factoring, a type of lending used heavily by retailers. The company has spent months trying to reassure its clients that it will remain open for business as stores ramp up for the holiday season. Relatively few other companies serve as factors, and among them are other embattled lenders like GMAC. Ford, the only Detroit automaker to dodge direct government aid and bankruptcy court, surprised investors with net income of nearly $1 billion in the third quarter and forecast a “solidly profitable” 2011. Really, only proving that if the govt stayed out of things, companies would either survive or fall on their own. Although there is the cash for clunkers program which helped. The latest results signal that Ford’s turnaround is on more solid ground. The company lost more than $14.6 billion last year and hasn’t posted a full-year profit since 2005. While it made a profit in the second quarter, that was mainly due to debt reductions that cut its interest payments. Hmmm, wonder when I get my interest payments cut, becuase it sure is not falling down to the common man even though they are using my tax money to bail them out. There is no life left at Saturn. Another G.M brand dead. Yesterday Penske Automotive Group announced that it has cancelled plans to acquire General Motors’ Saturn unit. As a result, GM said it will wind down the brand and dealer network, potentially putting 13,000 Saturn dealership jobs at risk. The reason the gave for walking away from the deal was that they were unable to find a manufacturer to make Saturn cars when GM stops producing models sometime after the end of 2011. So just like Oldsmobile, Saturn will become a collectors item dead. Sure glad we gave them that bailout money and cash for clunkers to keep going. As the rest of the bailout money has shown all we did was delay the inevitable at the cost of tax payers now it just looks like a few more thousand other folks joining the unemployment line.